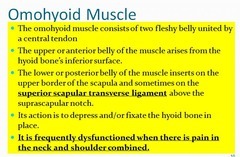 The Omohydoid Syndrome is a painful syndrome in the neck due to injury or dysfunction of the omohyoid muscle. The omohyoid muscle is a small muscle in the neck that originates at the upper border of the scapula and inserts into the hyoid bone. The pain is muscular in nature, located in the neck near the clavicle. The pain can be mild to moderate. There can be pain on swallowing. The Omohyoid Syndrome is usually caused by trauma, such as whiplash, or by excessive vomiting. MRI scans of the neck can look for injury to the muscle and to exclude other causes such as tumors. Treatment is conservative and includes non-steroidal anti-inflammatories and muscle relaxants. Physical therapy, including heat, ice , ultrasound, and stretching may be useful modalities to decrease pain and muscle spasm in this issue. Injection of the muscle with a solution of a local anesthetic and a steroid may also provide some relief.